Looking for a savings account with more than 0.01% APR to put your tax refund in? You can use a savings account to put your emergency fund (best practice is 3 to 6 months of living expenses). You can take advantage of compound interest (reinvesting your interest and making more $ on it). Many other sites include Synchrony because of their high 2.05% APY, we were hesitant to include them because of the negative customer reviews we found online. 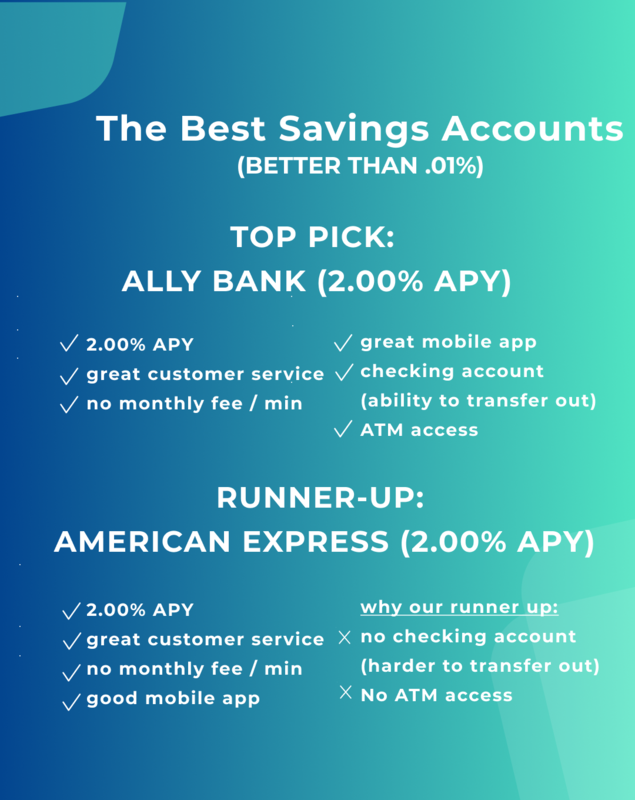 For those that are looking for some quick cash back, a lot of banks offer incentives to open an account (you can check out some options here). Unfortunately, they often come with some fine print (e.g., min for no monthly fee, qualifying transactions, etc. ), so we would recommend only doing this if you are diligent about it. If you are willing to park your $ for more than 18-24 months and you are 100% sure you won’t need it, consider CD options.